The Maserati 3500 was first released for sale on the public market in 1957, and was intended to be the very first vehicle specifically aimed and geared towards the Gran Turismo market, and during its 7 year reign on the market, some 2,210 models in total were produced. During the 7 years of production of the Maserati model, many top Italian designers, all of whom were experts in their fields, were enlisted to improve and expand upon the design of the car what with the likes of Frua and Bertone to name but a few. Unlike its competitiors the Maserati became famed for being a true modern classic, elegant, understated without degenerating to garish vulgarity as was sometimes an issue with the products released from Ferrari. The true beauty and magic of the Maserati lay in the design and function of the engine, the engine was a classic sports car engine, the engine itself was created using pure aluminium, utilising hemispherical combustion chambers as well twin spark plugs. A widely held belief by consumers and critics alike at that time, and indeed even to this very day, was that regardless of the different designs and designers, the style that triumphed above them all without a shadow of doubt was the Touring. 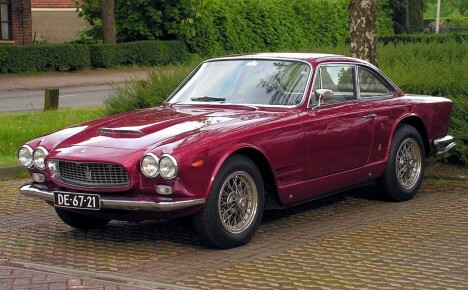 The Maserati 3500 has a special significance not only because it heralded a change in the strategy and focus of the Masertai company (as it attempted to break into new, previously untapped markets) but in that the model single-handedly changed and improved the financial odds of the company. The Maserati 3500 went a long way in salving the diminished funds of the Maserati company, such funds had been depleted by virtue of racing expenses and increasingly fierce competition from fellow rivals. By virtue of its phenomenal market strength, popularity, and profitability, the funds amassed by the Maserati 3500 heralded a total transformation of the company from a company which had struggled to produce 14 cars a year, into a respectable, industrial power house capable of grand scale mass production. The Maserati 3500 was first unveiled in March of 1957, and boasted a 3485cc straight six cylinder engine which was capable of producing 235bhp and gave the car a top speed in excess of 140mph but the cars design was a continuously dynamic process, continual upgrades and improvements frequently made. For example, power windows were originally an additional option, these soon became standardised, and other minor issues included standardisation of rear discs. 1960 saw the introduction of the five speed transmission as well as the release of the Vignale Spyders (also known as the Maserti 3500 Gran Turismos). Not long after the release of the basic 3500 GT model, due to increased demands by the consumers, a open top version of the GT Coupe was released, this model proved to be especially popular within the Northern American market. 1962 saw the release of the Maserati Sebring, as the company intended to release a new model of car to supplement and expand upon the success Maserati had enjoyed with its 3500 model. The Sebring was originally called the 3500-GTIS, but later dubbed the Sebring in commemoration of the success Maserati had enjoyed at the Sebring racetrack. The Sebring has the dubious honour of being classed as Jeremys Clarksons 77th most favourite car.